Ornamental grasses, including bamboo and grass-like plants such as liriope, are some of South Florida's easiest-to-grow plants. 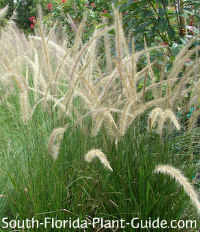 Most grasses are easygoing cold hardy plants that like a sunny spot, a regular drink of water, and not much else. Trimming is minimal, and some can be cut back to the ground in spring for a flush of new growth. Striking and unusual, Florida ornamental grasses can be a great texture plant to accent a home landscape. Some have a soft, cascading look, while others grow wider leaves on upright stalks. You can use some grasses for their color, too. 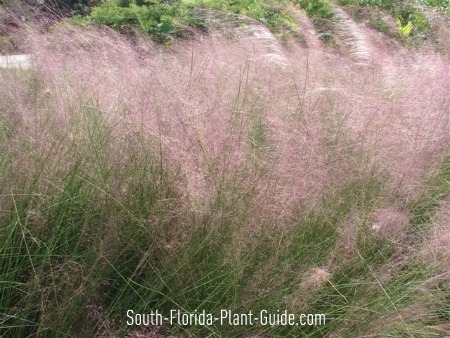 Muhly grass, pictured at top, has soft pink-purple plumes. Red fountain grass is popular for its burgundy leaves. White fountain grass (left) has creamy plumes. Versatile "grass-likes" work almost anywhere you need a low-growing, easy-care plant. They can set off the plants behind them, even hiding a bit of "legginess" on background shrubs. They also add a soft, flowing line along a garden edge, path or along a walk. You may be surprised to learn that bamboo is a type of grass. 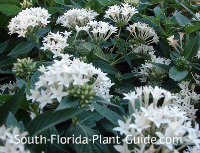 Yes, it's fast-growing but if you choose a variety with an ultimate height (mature heights range from 8 feet to 50 feet tall) and width you can live with, it makes a fantastic addition to your landscaping. 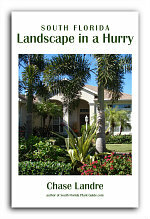 Lots of people shy away from bamboo, afraid it will take over their yard and turn their landscaping into a jungle. There are two basic types of bamboo: running and clumping. 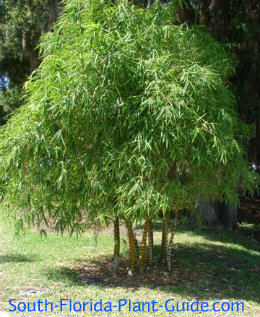 Running bamboo is the one you want to run from - it sends out runners that shoot up from the ground well away from the main plant...invasive and almost impossible to get rid of. Clumping bamboo, which is what reputable plant nurseries sell, only sends up new canes right at the base of the mama plant. It does spread out but right from the central area so you know what to expect. AMAZING FACTS ABOUT BAMBOO: Bamboo has a lot of positive attributes - as well as being one impressive landscape plant. Its canes are stronger than steel in tensile strength. In fact, in some countries scaffolding made of bamboo is still in use today, even to build skyscrapers! Bamboo produces about 35% more oxygen than trees. It's also used to remediate polluted soil, and on steep slopes it can halt soil erosion and prevent landslides and washouts. along the property line as a "friendly fence"
Grass Likes - Aztec Grass, Liriope, Mondo ("Monkey Grass"
Ebooks all about gardening in South Florida! Learn more!